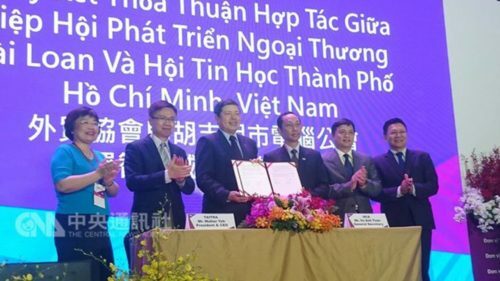 The Taiwan External Trade Development Council (TAITRA) signed a memorandum of understanding (MOU) with Vietnam's Ho Chi Minh City Computer Association (HCA) Friday covering cooperation in smart city technology and services. With a Vietnamese plan to turn Ho Chi Minh City into "Asia's Silicon Valley," TAITRA said that Taiwan has many years of experience in creating smart cities, in addition to strong research and development, original equipment manufacturer (OEM) and original design manufacturer (ODM) capabilities. With Taiwan's experience and advantages in the construction of smart cities, future cooperation in agriculture, education, transportation and other fields between Vietnam and Taiwan can be strengthened, TAITRA said. TAITRA Chairman James Huang said smart cities are the focus of development in major countries around the world and Taiwan has established very strong foundations in the information communication technology industry.